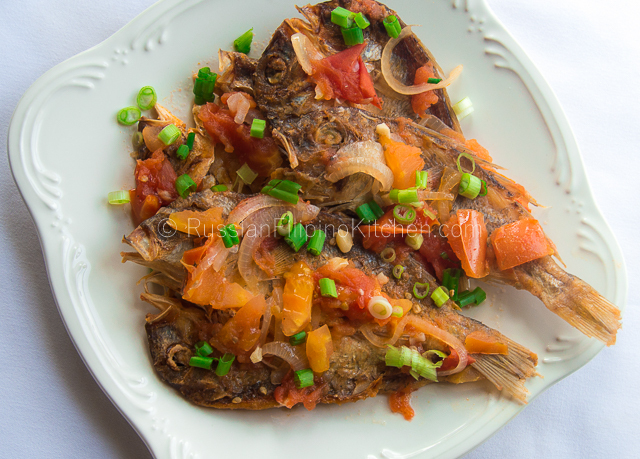 Sarciadong daing [pronounced DAH-ING] or dried fish sarciado is a Filipino fish recipe also known as “sinarsahang buwad” in my native Cebuano dialect. It’s a simple dish made from salted dried fish braised in a tomato-based sauce and cooked long enough for the liquid to reduce and the flavor to get absorbed. When I was growing up, this dish is often part of our family meals especially those days when money was tight and we couldn’t afford to have fresh fish and meat. My mom will make a big pot of boiled corn grits or rice and cook sarciadong daing intentionally making it with more sauce so we kids could sprinkle them on top of rice. This recipe is popular during Lenten season as well when Catholics abstain from eating meat on Good Friday. I personally don’t prepare this dish at home often but only during those times when I’m craving for something salty. The traditional way of making this disg is to fry the salted fish first before cooking them in the sauce. But since I want to avoid stinking up our kitchen badly (oh yes, this is one of the few Filipino dishes that stinks! ), I skipped the frying and add the “daing” directly into the sauce. There’s not much difference taste-wise in my opinion. The good part is it doesn’t smell as bad in the kitchen after cooking and less oil is used. However, if you’re OK with frying them up first, go ahead and follow the steps below. 1. Soak salted dried fish (daing) in a bowl of cold water to remove most of the salt. Let it sit for 15 minutes or so then rinse under cold running water. (Note: This step is necessary to reduce the saltiness of the dish. Most salted dried fish are very salty in order to preserve them longer. However, if you have access to the less salty variety mostly found in many wet markets in Philippines, you can skip this step). 2. Rinse tomatoes and remove the core. Chop into chunks. 3. Peel garlic and onions. Then thinly slice onion and mince the garlic. 4. Heat skillet or cooking pot over medium high heat. Add oil and sauté onions and garlic till onions are translucent and garlic has browned a little, about 2-3 minutes. 5. Throw in tomatoes and sauté until slightly limp, about 3 minutes. 6. Season with 1/8 tsp ground black pepper. 7. Add water and stir. 8. Submerge salted dried fish into the pot, arranging them in layers that allow the liquid to touch the fish. 9. Bring pot to a boil. Once boiling, turn down heat to medium low and simmer for 15 minutes until the sauce has reduced. 10. Transfer to a serving platter and garnish with chopped green onions on top. Soak salted dried fish (daing) in a bowl of cold water to remove most of the salt. Let it sit for 15 minutes or so then rinse under cold running water. (Note: This step is necessary to reduce the saltiness of the dish. Most salted dried fish are very salty in order to preserve them longer. However, if you have access to the less salty variety mostly found in many wet markets in Philippines, you can skip this step). Rinse tomatoes and remove the core. Chop into chunks. Peel garlic and onions. Then thinly slice onion and mince the garlic. Heat skillet or cooking pot over medium high heat. Add oil and sauté onions and garlic till onions are translucent and garlic has browned a little, about 2-3 minutes. Throw in tomatoes and sauté until slightly limp, about 3 minutes. Season with ⅛ tsp ground black pepper. Submerge salted dried fish into the pot, arranging them in layers that allow the liquid to touch the fish. Bring pot to a boil. Once boiling, turn down heat to medium low and simmer for 15 minutes until the sauce has reduced. Transfer to a serving platter and garnish with chopped green onions on top.